So villagers could get medical advice and treatment, a one-room Dispensary was built in 1992 and a qualified nurse was appointed. Overnight care was possible from 1998, as the people of the villages had built a more spacious Dispensary. Child-birth became safer because a registered midwife was appointed in 2003 and when an operating theatre was constructed in 2006 minor surgery could begin. Even better, a doctor began to visit one day each week. Thanks to a generous sponsor, and the time and energy of the villagers, the building of a General Ward began in 2009 and, by 2010, it was finished and furnished. Today, people now come to the Health Centre from well outside the boundaries of the eight Kanyike villages. There are five permanent members of staff - a clinical officer, two nurses (one qualified in midwifery) a counsellor and a lab technician. A doctor, dentist and a surgeon visit weekly for minor surgery and antenatal care, including advice on the transmission of HIV. Postnatal care and support is also available. But there is still much to do. For example, fridges are essential for the safe storage of general or HIV/AIDS vaccines. These fridges run on paraffin or butane gas and need ongoing maintenance. Solar power is increasingly used and, to everyone’s delight, a generator began to supply electricity in early 2016. Since 2004, mobile health clinics have taken practical medical care and advice beyond the Medical Centre and out into the community. These might be in the open air, but people queue for treatment. 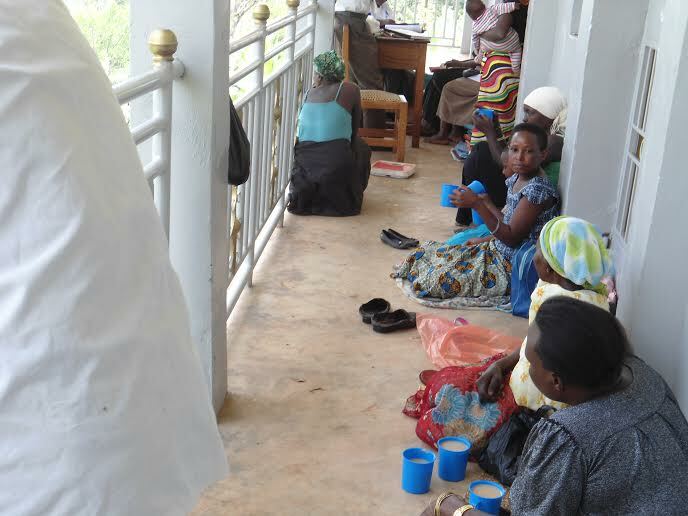 In 2014 the Kanyike Project was able to double the number of these clinics from once a month to fortnightly. This was a real highlight of that year. 100% more medical aid now comes to the vulnerable and those in most need. Children are weighed and immunised. Pregnant women are examined and monitored. The elderly have access to aid without the need for a long journey. Testing for AIDS is offered and counselling provided. Early diagnosis and use of anti-retroviral drugs means children with AIDS can now expect to live a full life. This is all part of the Community Based Health Care Programme, which is headed by a qualified health worker, assisted by eight local volunteers. They monitor sanitation and the condition of the springs, and continue the on-going battle against HIV/AIDS. They visit all the households of the Kanyike Project, stressing the importance of hygiene in the prevention of diseases. The volunteers are given bicycles to carry out their visits, and in return for their contribution and they can use the bicycles in their free time to take produce to market, offer transport to others and carry water.